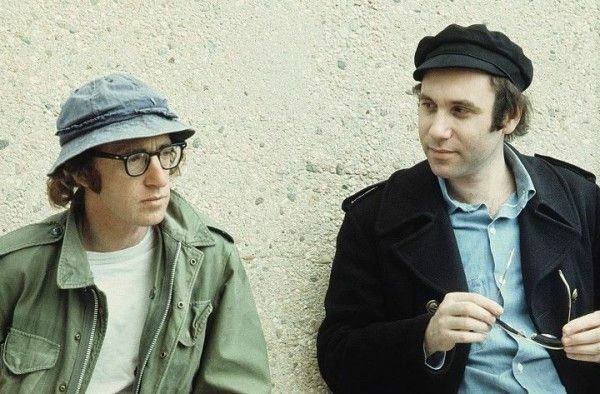 Woody Allen deserves a three hour documentary, and with Robert B. Weide’s Woody Allen: A Documentary, the artist’s life and work is put into great perspective. Done originally for PBS, the two part film covers his early years working as a joke writer and stand-up through to his transition into master class filmmaker. For those looking to get a handle on a career that now spans over 50 years, it’s a clear, concise work that reminds why he used to be hilarious, and why he’s now revered as one of America’s greatest working filmmakers. Our review of the DVD of Woody Allen: A Documentary follows after the jump. Starting with interviews with some of his famous fans and collaborators, the film introduces Allen as a legend, and then talks about his early years. In a lot of documentaries this would be the most boring passage, but since Allen has spotlighted his childhood through fictional accounts in such films as Annie Hall and Radio Days, this is great to compare and contrast to Allen’s slightly fictional version. Though his family didn’t grow up under a roller coaster, his parents didn’t get along and his father took many jobs to support the family. Allen found work in high school writing gag lines, and quickly moved to writing jokes for comics – which made him more successful than his father. He married (and divorced) early, and his management forced him into stand-up comedy. He was painfully shy at first, but eventually got the hang of it. Seeing and hearing some of his old gags, you can tell that he was made for the format. His management forced him to do more public appearances and television – which is different than the slightly reclusive figure Allen’s turned into over the years – and it’s great to see him doing things like boxing a kangaroo in some of the clips. His success led to more writing jobs, including screenplay work and eventually a shot at directing himself, which ends the first act of the documentary. The middle section is dedicated to his film work up to Manhattan, and it shows the director gaining confidence, and the career-changing effort that Annie Hall was. Though it doesn’t get too much into how that film mutated during the filming process, it does show that it was his artistic breakthrough to his more serious side. It covers his work on Interiors, and the return to form and majesty of Manhattan, which Allen initially hated. Alas, once the film hits the second disc/part, it gets into the Mia Farrow years. Allen has mostly kind words to say about his former cinematic collaborators, as do many others, but the documentary slides over that period of his career until the drama with his current wife enters into the picture [Ed. note: Soon-Yi was not Allen’s step-daughter, but the adopted daughter of Farrow and Andre Previn]. That too is given a gloss, and then it talks to some of his more successful films over the last couple years, ending on the high point of Midnight in Paris, which is his most successful film. The filmmaker also seemed to have behind the scenes access to You Will Meet a Tall Dark Stranger, which is lesser Woody, but the interviews with the cast members are great for that. If there is a problem with the documentary it’s that it must be compromised to have Allen’s involvement as the documentary feels like it should have been much, much longer. The attention paid to the earlier films is great, but you wish it could dote on the greatness of his films made with Mia Farrow, many of which are among his best (from Zelig to Hannah and Her Sisters up to Husbands and Wives), or even his 1990’s films, where films like Celebrity, Sweet and Lowdown and Deconstructing Harry mostly get passing mentions. As Allen has made virtually a film a year since the 1970’s, this is easy to understand, but still. The price for that lack was likely Allen’s involvement, and his commentary on his early years and his films is priceless. As I said, Allen’s become somewhat press-shy, and getting him to talk about his beliefs and his movies makes this a must see. Docudrama film’s release presents the documentary over two discs, with all supplements on the second. The film is presented in anamorphic widescreen (1.78:1) and in 2.0 mono. It varies between movie clips, current interviews and period footage. The transfer is fine, with the modern footage shot on HD. The supplements included five cut sequences from the documentary (18 min.) and an interview with the director Robert Weide (6 min.). All of which are worth watching, and well chosen. For more on the film, here’s Adam’s interview with Robert B. Weide.